Countertop water flossers are ideal when you don’t want it to run out of juice during your flossing routine. 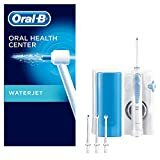 After researching through many countertop Oral-B water flossers, we’ve found a reasonably priced one with some great features which we’ve summed up in our Oral-B Water Jet Oral Irrigator Cleaning System review. Besides being a compact size for a countertop water flosser, it has a generous water tank capacity and can be mixed with mouthwash to get that extra fresh clean teeth sensation. It’s pretty powerful and keeps gums healthy through stimulation and massage whilst removing food particles even in areas that are hard to reach. Targeted cleaning – The Single WaterJet Stream technology is better for targeting problem areas for a more direct clean which helps to improve gum health. It’s great for getting in between gaps in your teeth too. Adjustable pressure – Intensity of water pressure can be adjusted to suit your gum needs. Operates via the mains plug – Fitted with the 2 pin plug that can be used in the shaver socket in the bathroom so there’s no risk of running out of power during your oral cleaning routine. Compact size – It’s fairly slim in width and depth. Wall mountable – There is a mounting plate on the back with hooks enabling the unit to be hung to save a bit of counter space. Large reservoir tank – It has a 600 ml water capacity similar to the Waterpik WP120 which will give a runtime of 90 seconds. Suitable for use with mouthwash – For a cleaner and fresher feel, mouthwash can be added in addition the the water in the tank. Includes 4 WaterJet nozzles – Enough for a small family to use or last one person the whole year. Not all of the best water flossers include that many extra tips. Storage compartment for extra nozzles – All the nozzles can be kept clean and dry within its own compartment on top. Although there is just the 1 jet mode which is the Single WaterJet Stream, the pressure of this can be adjusted with the easy to use 5 power settings. Users can adjust the dial on the side of the unit from a gentle to high pressure. The lowest setting is quite gentle on gums and it’s ideal for use when gums are sore from tooth extraction, gum disease, inflamed gums or anyone with sensitive gums. The pressure is enough to loosen and remove food debris and plaque. However, for large food bits or brace wearers, it’s better to use the high pressure setting. If you’re using it late at night, the noise generated from this water flosser can be noticeable but it’s faint if the door is shut. It’s not overly loud but it’s at an acceptable volume. With the Oral-B Water Jet Oral Irrigator CLeaning System, there’s only 1 flosser tip that’s compatible with this which is the Water Jet replacement nozzle. The reason for this is due to the nature of the oral irrigator’s single Waterstream technology. Keeping teeth and gums healthy as the tip can be used to gently rub along the gum line. Removing food particles to reduce plaque buildup. Reaching those hard to reach areas with the single tip for targeting cleaning. Leaving a fresh clean feeling with the creation of micro air bubbles. Providing fresh breath and healthy gums. This oral irrigator is fitted with a 2 pin European round plugs which fits into shaver sockets found in UK bathrooms. However, if your bathroom doesn’t have one of these, a shaver adaptor can be purchased separately to enable it to be plugged into the usual plug sockets. It’s compatible with the UK’s 230 voltage socket. The unit should be placed near to the sink to make it easier to use as you will need to lean over the sink during use for the water to trickle out. After much research from customer opinions and the product itself, we’ve pretty summed everything up in our Oral-B Water Jet Oral Irrigator Cleaning System review and we’ve come to the conclusion that it’s quite effective in cleaning teeth and gums. Even with just one use, it can remove a lot of plaque in one go so just think how easy it will be to maintain your oral hygiene with this water flosser.